So soft and cozy, you'd never know that each 50 yard bump of ReLove Merino rescues some 15 plastic bottles from being thrown in a landfill. That's right! 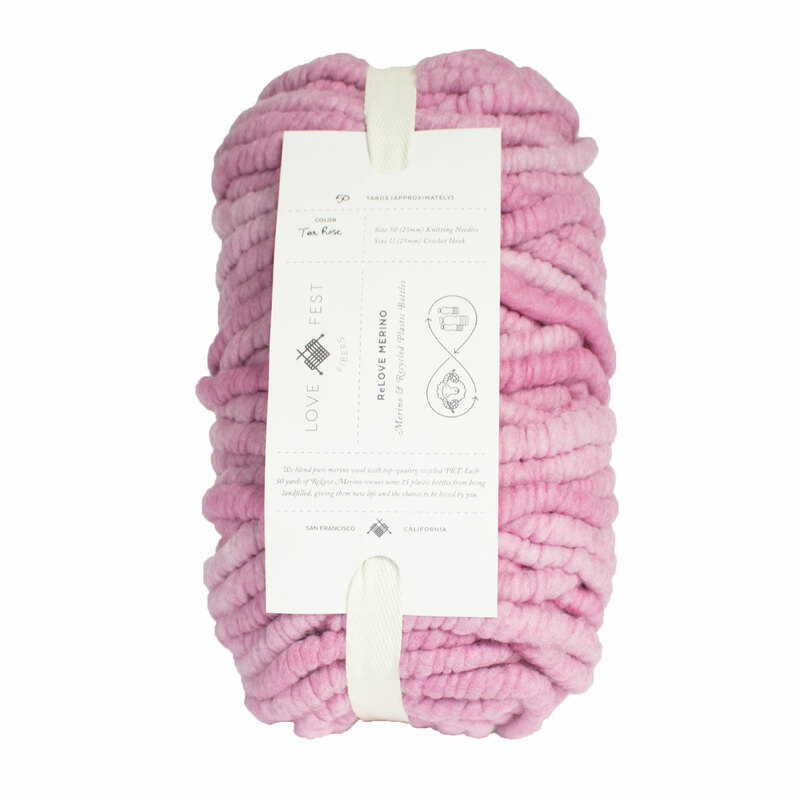 ReLove Merino is made from ethically sourced South African merino wool and Global Recycle Standard Certified rPET. ReLove Merino is spun in small batches on a Washington State family farm. Each bump is carefully crafted, taking 1-2 hours to spin. ReLove's super bulky weight makes it a dream to work with, a full size throw can knit up in a day on size US 50 needles, US U crochet hook, or even just your arms! Love Fest Fibers ReLove Alpaca Yarn and Love Fest Fibers Pure Love Alpaca Yarn are both similar yarns: dry clean, super bulky (11 sts or less/4 in), 1 sts / inch, 510 gram, on size 50 US needles, and 50 yards. What about yarn that have the same look and feel? Find more yarn that is recycled or reclaimed fiber, sheds and pills. You may enjoy taking a look at the , and Love Fest Fibers ReLove Alpaca or ReLove Merino Emily Vest I kits all using Love Fest Fibers ReLove Merino Yarn. Hopefully our suggested project ideas for Love Fest Fibers ReLove Merino Yarn can help you come up with your next exciting new project idea!